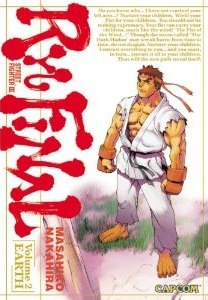 Ryu Final is another manga series from Masahiko Nakahira, and concludes the story started with his Street Fighter Alpha manga. 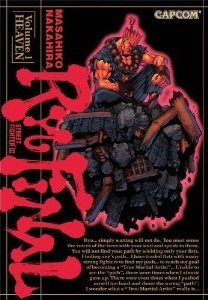 Ryu is once again the main characters, as he seeks to become a true martial artists -ending with a final battle against Akuma. But to get himself to that level, Ryu starts another journey, meeting and fighting various warriors along the way. 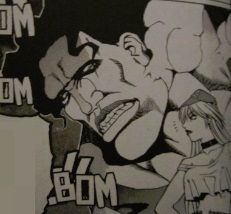 Ryu, along with his new master, Oro, eventually end up in Germany. Travel expenses leave them without much cash, which is something Poison happens to overhear them talking about. She offers Ryu a challenge: survive 3 minutes against Hugo! Hugo doesn't want to fight at first -he tells Poison that his mother, who he wants to see someday, won't be proud of him earning money this way. She's a proper lady, unlike her. Poison hits a nerve by telling Hugo that his mother isn't a proper lady -how could she be if she raised him up, a wimp who skips work for personal reasons! This gets Hugo to come out and fight with Ryu. Hugo's overwhelming size and power proves to be more than a match for Ryu, with the latter having a handicap thanks to Oro stopping him from using certain techniques. Hugo gets to use a few of his moves from Street Fighter III: 2nd Impact, such as his moonsault press. After a short battle, Ryu manages to hit Hugo with his shin shoryuken technique. The match ends in a double knock out. 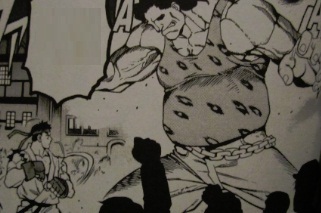 Later on, Hugo and Poison are seen helping repair work on the town (parts of which were damaged in the battle) before Hugo decides he can see his mother again now. Later on, Ryu fights Dudley. At one point he thinks about people he's previously met, and Guy makes a small cameo. Later on, Hugo and Poison travel to Thailand, where they meet Sagat. Hugo tries to fight him, but he can't even scratch the Muay Thai Emperor's body. Sagat defeats Hugo with one strike. An English language version of Ryu Final has been released by Udon Entertainment, in a two volume series. 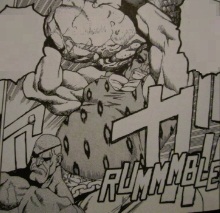 The first volume contains the Ryu Vs. Hugo fight, whilst the second volume has the short scene with Sagat.